﻿ Van Heusen – Suited for wedding! Home » Projects » Visual Merchandising » Van Heusen – Suited for wedding! Van Heusen – Suited for wedding! Executed at around 350 stores pan India, Van Heusen’s Wedding Window depicted the card game concept while the kingly avatar of suited men was embodied by “king of cards”. 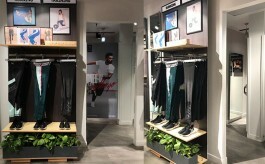 Menswear brand from Aditya Birla Fashion & Retail Ltd (ABFRL), Van Heusen, has recently executed its wedding window to showcase their collection of men’s suits. Defying the regular pattern of wedding window in India, the menswear major has depicted the imagery of “king of cards” to denote the kingly look of a man. The window, using two mannequins each, used materials like MDF for main structure and gold foil vinyl for printing along with golden mirror acrylic. 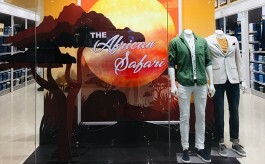 The window was executed pan India by Brand Connexion, Catalyst Design and Megha Digital for southern, western and northern parts of the country respectively.